In her work, Arendt calls for a re-examination of what structures the human condition and the interests of the public realm, a realm replaced by the private necessities of sustaining the continuity of life and not the necessary conditions designed for the taking place of other human activities constituting political freedom, such as the practice of ‘thought’ and the living experience of taking ‘action’. 1Hannah Arendt, The Human Condition, Chicago: University of Chicago Press, 1958, 324. A rethinking for what constitutes the human condition on the part of the audience, was according to Brecht the intent of epic theatre “a theatre that would appeal to an audience’s intellect rather than pander to an audience’s emotions”, who, less than been immersed within a play with the intent of having an emotional catharsis, would rather be invited to think about a particular narrative, or a given situation from a sufficiently removed standpoint. Viewers were urged to make a judgment and face something by the means of an argument, the taking place of action being transferred within them 2Henry Lefebvre, The Critique of Everyday Life, translated by John Moore, London: Verso, 1991, 21.. IDIOSYNCRASIES.CY strives to examine the human condition, in this case, constituting the social landscape of Cyprus, by investigating a selection of distinctive features of thought or modes of behavior that seem particular to it. These are explored through the creation of banners, which may themselves be described as extracts of its everyday realm that are not necessarily resolved or ‘purified’ but invite viewers to examine their own beliefs about what is or what is not presumed as being ‘true’ by a pointing to its contradictions. For this project there was a series of workshops and round table discussions amongst the artists, the curator and the organizers where the resulting artworks were developed in a friendly but critical atmosphere. It drew on ideas concerned with ‘active’ processes of exhibition making, as well as the bringing in of people from various disciplines that were involved with its organization as well as final execution. It sought to move towards a more-democratic system, one that was less individualistic. This workshop started with identifying and exploring the subject matters for the artworks and their possible translation for the prerequisite banner format of the exhibition. Oddities discussed in relation to the social landscape of Cyprus included apathy, prejudice and stereotypic racism, intolerance of difference and discrimination, self-censorship of one’s voice and the willingness to passively accept many forms of injustice such as corruption, repression and cruelty, inconsistencies that were addressed by the eleven participating artists through the creation of eight banners. 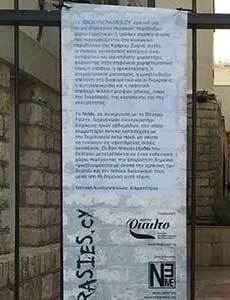 These banners could be doing what Leong Jacobson describes as being, the manipulation of the “official voice” of public announcements, the undermining of its authority, in order for other voices to emerge, and in this case, an attempt to destabilize what constitutes Cypriot cultural understandings for human behavior by a reaching out to a public consciousness in the means of provoking a reaction. 3Davina R. Jacobson-Leong, Destabilizing Cultural Assumptions; Language and Images in the Art of Jenny Holzer, scholarsbank.uoregon.edu/xmlui/bitstream/handle/1794/9963/Jacobson_Leong_Davina_R_1993sp.pdf, 1993, 1. These banners may be described as being a series of ‘truisms’, that is, a truism being defined as “a statement the truth of which is obvious and well known; a platitude; a commonplace”, and in this case, truisms – both verbal and/or representational -amounting to conventional Cypriot behavioural traits or ‘modes of life’. Truisms of which the narrative appears satirical, humorous, or at times even mournful for the current state of that which it portrays. Seemingly so, these works strive to catalyze a re-evaluation of the values constituting Cypriot commonplace peculiarities and perhaps as Jacobson-Leong points out, given the impossibility of transcending them, in any case, recognize their existence. Appropriately, the exhibition space for these banners is the Rialto theatre’s two side exit corridors, which the audience walks through when exiting the theatre’s performances, unintentionally stumbling upon the banners. Displayed in what may be described more as the theatre’s public and more accessible space, counter to what may be presumed as an interior ‘backstage’, IDIOSYNCRASIES.CY strives to establish what Leong Jacobson calls for as being a grassroots social dialogue, a “safe forum for public discourse” 4Davina R. Jacobson-Leong, Destabilizing Cultural Assumptions; Language and Images in the Art of Jenny Holzer, scholarsbank.uoregon.edu/xmlui/bitstream/handle/1794/9963/Jacobson_Leong_Davina_R_1993sp.pdf, 1993, 13.. An ambiguous tension is also inaugurated between the works and the site in which they are displayed. These banners may, in an analogous relation to the performances taking place inside the walls, be described as extracts of a real life narrative that designates the Cypriot everyday realm, seeking to provoke contemplation. © 2016-2019 NeMe and/or respective contributors.